The following video tutorial is an in-depth look at Excel Tables. I show you how to create a Table and then explain 10 awesome features that will save you lots of time when working with your data. The Tables feature is available in Excel 2007, 2010, 2013, and 2011 for Mac. This video is a step-by-step guide and the file I work with in the video can be downloaded below. Watch the video at the top of the page. What is an Excel Table? Tables are a feature in Excel that let you convert a range of data into an organized list called a table. They help automate many repititive tasks such as formatting, sorting, filtering, and summarizing your data. Tables bring a new and intuitive way to write formulas using structured references. They also integrate with Excel's most powerful tools including charts, pivot tables, remove duplicates, PowerPivot, and more. There are a lot of great benefits to using tables. Here are the 10 that I explain in the video. The video also shows some incredible new features for Excel 2013 including Recommended Pivot Tables and Recommened Charts. Here are some additional videos and articles that helped me learn tables. Please let me know if you have any others to add to the list. A whole book on Tables! My friends Zack Barresse and Kevin Jones have written THE GUIDE to everything Tables. This is a great read if you are looking to master Excel Tables. It also includes tons of information and resources for writing VBA for Tables. How Do You Use Tables? Do you use Tables? Why or why not? Please leave a comment below. And don't forget to subscribe to my free email newsletter below to get more articles like this and learn Excel. interesting ! Thanks for information ! Thank you Jon, love these tutorials and find them very easy to follow. Thanks for this very easy to understand tutorial. I am now a convert as I have been embarrassed by not having my pivot tables update with new rows. What if I am doing a vlookup on a table where the column I’d like to look up is not the first column in the table? How will the structured reference know which column to do the lookup? And, the @ sign tells the formula to work with the data in the same row as the formula, what if I need to lock the reference (absolute, not relative), how do I do that? Thanks so much for all your great videos, absolutely love them! Well done. I like to believe that I am a power user. I’m always pleased to find out that I’m missing some really powerful tools to do what I’m already doing manually. I was doing 50% of what I learned in this video. The other 50% is going to add great productivity. Thanks for another great video, I’ve seen your videos on pivot tables and dashboards. So I thought it might be worth while to take a step back and learn more about “simple” tables. It is. How can hide the formula with continue working formula,I meant can not show to other but formulas should work accordingly..
Great info on tables. Great job on the presentation. I think I might start to like them now. Thank you for making it clear and easy to follow. I also like using you pivot checklist. Jon I love your presentations. simple and easy to follow. Much appreciated. Keep up the good work. The 10 Excel Pro Tips Workbook was excellent. I like the way the 10th tip ended. Lol. I finally found that cell I kept thinking about from Tip 6. Excellent presentation. Hai Jon Thanks for providing such a useful videos with relevant practice materials.. really it helps a lot… and your voice so good for listening.. Thank you soo much for your hard work to extend our excel knowledge. What a informative video? Didn’t know there are so many features in simple table form. And small tips shared to avoid simple mistakes one makes while dealing with the data are very helpful. I am working as a financial controller in private sector. as you know as every body else on the field that the business owners’ are highly demandable in a special kind of reports reflecting the financial & operational performance measurement for the accounting period just ended. The reports which is usually asked for financial analysis prepared on excel sheet attached with it dashboard summarizing whole information in one simple sheet. My main queries how to convert financial information on the excel sheet prepared to A raw data which helps me out later on preparing creation a pivot table which finally helps me prepare a dashboard to the to management. As you know, financial analysis report prepared in a way that representing the on the column header the year or years ( multiple periods )and on the left side the criteria and core is the financial information figures for a balance sheet and income statement. hopefully, that I made myself clear enough, to help me preparing the dashboard as how it suppose to be done in a very professional way to be presented later on to top management. I will be so grateful if you send A case study file with editing ability to study on my personal email stated. Thanks, for your valuable support and help. Financial statements can be created with pivot tables. Getting the layout right can be tricky sometimes, depending on how you want to group and categorize the P&L and BS. I do have a free video series on pivot tables and dashboards that you might enjoy. 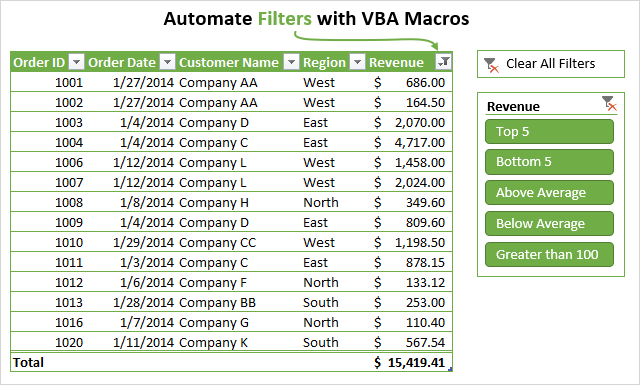 You can also create financial statements that pull in data from pivot tables using the GETPIVOTDATA function. This allows for more customization in your layout. I don’t have an article on that yet, but will add it to the list. Wished I had looked at this sooner. Great stuff question do you have anything on tables using VBA code? Thanks Paul! I do cover Tables (ListObjects) extensively in my VBA Pro Course. They are a great tool to use with VBA because they create a dynamic range within a sheet that is easy to work with and reference in VBA. I will try to create some additional training videos on Tables and VBA in the future. Thanks! Firstly, thank you very much for sharing above items. Secondly, I love advance excel, I would like to learn new and surprised things in advance excel. please share new tips and tricks in advance excel. I have an Excel 2010 workbook with 2 tables. One of the tables contains a vlookup formula. If I try to change the formula, instead of recalculating Excel just displays the formula in the cell that I tried to update. As a point of reference, I’m trying to change the formula in the first row directly below the header. I thought this would then update the full column. Automatic calculation is turned on. Even if I try to manually force the calculation, it still will not update the column. Any advice? The only thing I can think of is that you have an apostrophe in front of the equal sign. That will cause the formula text to be displayed in the cell and the formula will not calculate. I hope that helps. The videos are really helpful and you do a nice job explaining everything with clear and concise direction. However I keep running into this problem when I try to replicate the vlookup example you demonstrate. instead of the ([@[RepId]) you get in your example. The [#This Row] notation is used in Excel 2007. This changed starting in Excel 2010 to use the @ symbol instead. So you aren’t doing anything wrong. It’s just the version of Excel you are using. Sorry, I forgot to mention that in the video. Thanks! When should I be using tables vs named ranges in Excel? I think tables are a great feature, but I think for large amounts of data(500k rows), it can be hard to work with in excel.I think it would be beneficial to have a blog post regarding working with large amounts of data in excel. I have been using tables for some time now but I have been manually entering new weekly data from two csv files. I want to build a new set of tables, different layout, using the csv files. I have a working vba program which gathers all the ~400 files data into ‘standard’ arrays. It is possible to block copy table data into a structured reference array. Is it possible to start with such an array before creating the table? What does the syntax look like to build the array? Hello, I enjoyed your 3 part video on creating a dashboard in excel. I understand slicers and how they can be used to select various pieces of data with one or more of the items selected. But is there a simple way to create a slicer that allows you to input a range of values, either with a text input or a slider you can drag(similar to a timeline slicer)? For example if you wanted to select a range of values that are >0, or a range of 150-1000, instead of manually cntrl+selecting that many boxes in your slicer? One approach is to add an additional column (field) to your source data that contains the groupings. You can create the results of this column with a formula. Checkout my article on grouping times for some different ways to group the numbers or text. The VLOOKUP might be the best approach if your groups are uneven. Once you have a new column with the grouping, you can just create a slicer based on that field. I hope that helps. Thanks! Great question! You can use a IF function to create a formula for that. The main issue is that the header cells store the values as text. So we first need to convert the header cell to a date value with the DATEVALUE function. We also need to a special trick to make the start and end date cell references absolute with the structured table references. The formula gets a little long, but is definitely possible. I created a quick sample file that you can download and checkout. Here are links to some other articles that will help. I hope that helps. Let me know if you have any questions. I have been expanding my skills with tables and this video has been very helpful for periodically re-watching. I am also using pivot tables at work and confused a bit on how to expand the pivot table when copying in new data from one spreadsheet and have the data update in the pivot table. Thanku very much for sharing this valuable information. This video is really amazing. Thanks for enlightening me about tables. I had no idea about the versatility. Saved me days! Aweseme! Thanks Tom! I’m happy to hear that Tables are saving you some time. They are a really great feature. I a newbie at using excel and I keep searching tutorial in Youtube to help be more efficient in using excel application. I gotta tell you, I didn’t realize the value of the table function until I watch this video of yours. Great work! Thank you, I’m glad you enjoyed the video. I’m not sure why you are having issues with the remove duplicates, but I would be happy to take a look at your file to see if I can help. You can email your file to me at jon@excelcampus.com. I will try it out in the Mac version and see what’s up. That’s exactly why I made this post/video. There are so many great features of tables, and most users have not even heard of them yet. I learned so much from your videos. It has saved me so much time on my Excel schedules. Thank you. Thanks Chelo! I am really glad the videos help you. Please let me know if you have any questions. Learn 10 great Excel techniques that will wow your boss and make your co-workers say, "how did you do that??" Plus weekly updates to help you learn Excel. Hello and welcome! My name is Jon Acampora and I'm here to help you learn Excel. © 2019 Excel Campus. All Rights Reserved.